Carlson Leadership & Public Service Center staff, alumni, and supporters are saddened by the loss of Jane Carlson Williams on April 10, 2017. 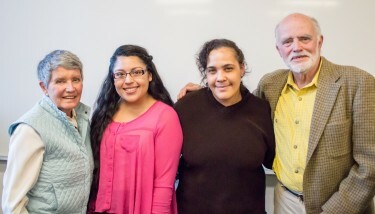 From left, Jane Carlson Williams, Carlson Civic Fellow Karissa Sanchez, Carlson Civic Fellow Paula Wilson and Gene Carlson. Jane, the daughter of Edward E. Carlson, for whom the center is named, was a member of the founding advisory board for the center and helped to shape the strategic direction of our work from the beginning. Jane was committed to undergraduate participation in public service, and understood that students develop as leaders when involved in purposeful work that benefits society. Jane served as a mentor and thought partner to Carlson Center leadership, forging friendships with past and current Carlson Center directors. We will miss Janie’s smile, thoughtfulness, commitment to students and community. Learn more about Jane’s legacy of community leadership.